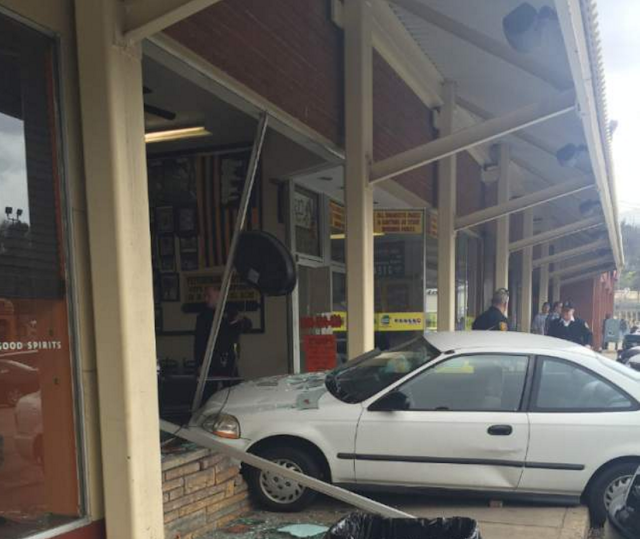 PITTSBURGH —An emergency response is in progress at Giant Eagle in Greenfield, where a car somehow ended up on the grocery store’s roof Tuesday morning. 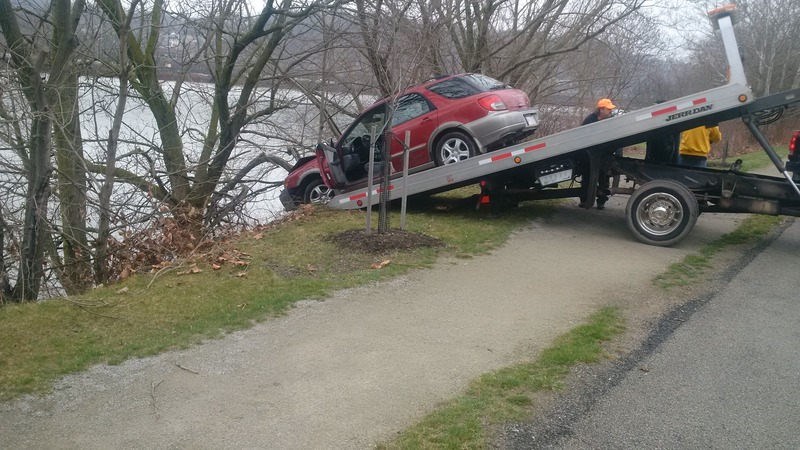 From the photo – the car crossed over the bike trail before hitting the tree. Sarcasm aside, this could have been much worse. My coworker was waking there at the time of event had happened. So soon as I get home I will post two pictures be took. This ones from out of town, but it includes a bike. Police were chasing a suspect on a bike when the cop hits a building. The officer “pulled up near the bicyclist and called him out by name, told him to stop, and the bicyclist took off,” Lamoureux said. A chase ensued into the semi-circular driveway of the Windsor Square Retirement Community at 9912 48th Drive NE. The chase lasted “less than a block,” Lamoureux said. A second officer heard the commotion and also drove into the driveway to catch the bicyclist. He couldn’t stop his patrol car in time and crashed into an apartment. The investigation by collision detectives will look into the possibility that a mechanical problem with the police car contributed to the crash, Lamoureux said. He declined to specify what kind of problem is suspected. Not in Pittsburgh, but this belongs on this thread, not the out-of-town one. Geneseo, NY: A truck has clobbered the fountain in the center of town, toppling the 100-year-old bear on the pedestal. Tens of millions of cars have passed this fountain and managed not to damage it. Not anymore. I went to undergrad here. The only other time the bear has been off the fountain in my 40-year knowledge of the town was the night of the 1980 Olympics when we won the USSR hockey game, and then it was crazed and drunken students who pulled it down, not a car hitting it. I’m sure a good many of those tens of millions of cars who drove past it were piloted by drunken teenagers (yeah, the drinking age was 18 when I was there), and somehow we managed not to kill the fountain. So we’re all now wondering, just how? A couple more posts, as news filters in on Facebook. Apparently it was a truck. So, here it is again…. The state saw increases in fatalities where a single vehicle ran off the road (580, up from 534) and where a vehicle hit a fixed object (459, up from 425). So about a thousand drivers/passengers were killed in the state last year without any help from another vehicle. A subscription is required to access this premium local content. One person was taken to a hospital Tuesday after a waste management truck rolled into a house in Hopewell Township, according to officials. The house in the 1400 block of Western Avenue was knocked off its foundation by the truck, which rolled down a hill, officials said. 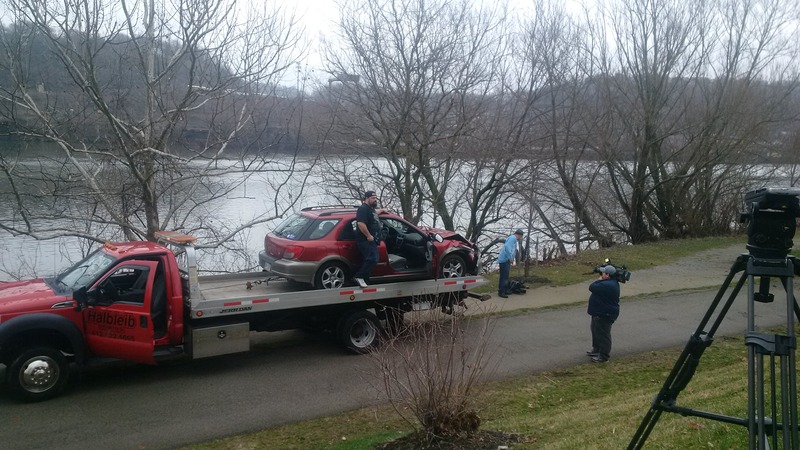 Car Crashes Into Castle Shannon Apartment Building, Elderly Woman Injured. Officials say a 90-year-old woman thought she had her vehicle in drive when it was actually in neutral. 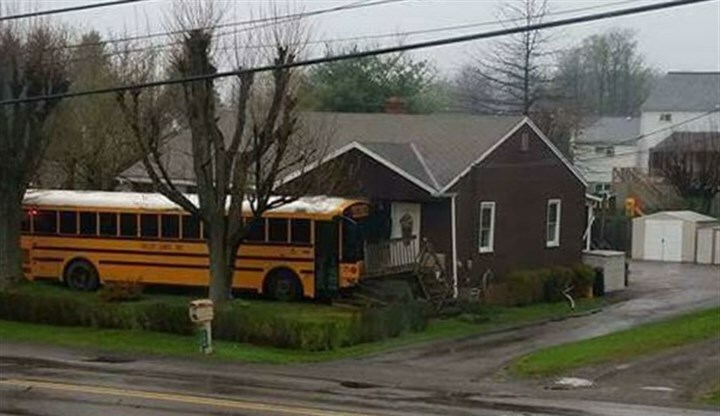 Surprised this wasn’t already up here: school bus into house. Car in Butler County removes house’s second floor rear deck. The article does later clarify that someone was indeed driving the vehicle. 25 mph sign clearly visible in the report. “Witness Ahmid Alford told Bofta Yimam that the driver of the truck “was crying, saying he just bought the truck.” Alford added, “[it’s a] dangerous house,” saying it’s the sixth time in his memory that cars have crashed into that spot of Larimer Avenue. Or, you know, it’s dangerous driving.” — Eat That, Read This. PG Mount Washington story has a byline (Karen Kane), refers to the crash as an “incident”. PG Wilkins Twp story has no byline (just “Post Gazette”), refers to the crash as an “accident”. PG April 22 story about the school bus also has no byline, but refers to it as a “crash”. So, we’re making progress in not automatically calling them “accidents”. We’re nowhere near done, though. 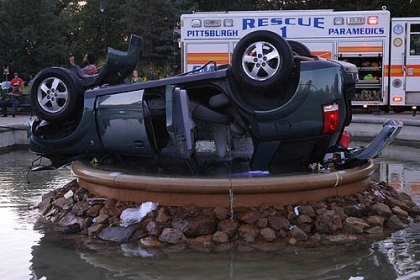 The aquarium crash was one of three over the weekend, summarized in this KDKA story. Garbage truck rolls backwards into house when operator forgot to put on the brake. Garbage Truck Hits House In Cranberry Twp. A church in Millvale failed to jump out of the way. Baldwin Borough police are investigating a potential marijuana grow operation at a home on Churchview Avenue. The investigation began when a car crashed into the house in the 3200 block of Churchview at 1:10 a.m. today. “We went to check on the occupants and found what appears to be a grow operation” inside the house, said Detective Tony Cortazzo. He said no one was hurt in the crash and the damage to the home was not significant. He declined to identify the occupants of the house because no charges have been filed and the investigation is continuing. BTW, the Baldwin Police station is a block further up the street. Well, the speed limit there is 25 mph, so it can’t be because the truck was going too fast and couldn’t make a turn.